The Giant heron or Goliath heron (Ardea goliath Cretzschmar, 1827) belongs to the order of the Pelecaniformes and to the family of the Ardeidae and is the biggest heron amongst its similars. Not for nothing when it was classified they gave it the name of Goliath specifying with only one term, what was the most striking characteristic of this bird and the one which would easily identify it in the natural history. Actually, this heron has a remarkable size and is certainly distinguishable on the field when compared to other congeners, but absolutely in the normality intermingled with all those waders that in Africa reach measures to which we Europeans are not surely used. It would seem strange that Linnaeus had missed a specimen of the kind seen the dimensions and that the classification has happened many decades after the last revision of his Systema Naturae but it is clear, by observing most of the species that lived in African tropical and equatorial ecosystems that in that time was quite difficult to visit those places and it was even more problematic to send specimens in Europe. Only at the middle of the XIX century began that series of explorations that led in those sites pioneers, explorers and naturalists who built up the history of the modern taxonomy. There was a real race to the explorations which involved hundreds of persons, at times simple wealthy and bored people, catapulting themselves in wild environments where often they lost their life but that have surely written the history, such as Stanley and Livingston, Burton and Speke and pure naturalists like Rüppell and Daudin, Temminck and Philip Jakob Cretzschmar, rightly the one who has classified this heron. The etymon of the genus Ardea gets its origin from the old Roman mythology. The city of Ardea in Lazio, close to the growing town of Rome, was at the time the capital of the Rutuli and was completely destroyed and totally reduced to ashes by Aeneas. From its ruins a big bird did rise who, once shaken off the ash that covered totally its plumage and after having emitted a long song, was discovered to be of candid colour: a secure relationship with the Phoenix. The species goliath comes directly from the Bible and refers to the character of Goliath of Gat, the champion of the Philistineans who was defeated by David’s sling in the mythical duel. It is sure that his legendary height of six cubits and one span (about 2,86 m) is somewhat disproportionate for the giant heron, but is surely indicative about the particularly important size of this bird. As a matter of fact in every common European names is recalled this reference. Airone gigante o Airone Golia in Italian, Goliath Heron in English, Goliathreiher in Gerlan, Garza Goliat in Spanish, Héron goliath in French and Garca Gigante in Portuguese. One last curiosity about the origin of the Italian name of airone. It should come from the dialectal version aghirone, in turn gotten from the old Latin “hairo”. 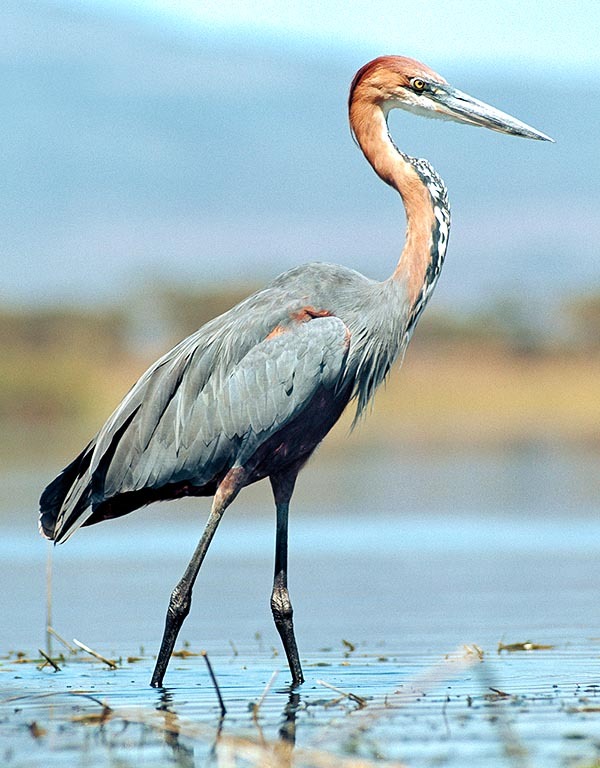 The Goliath heron is an African species and occupies entirely and diffusely all the area south of Sahara, Madagascar included. With meager populations it occupies also some regions of tropical Asia, from the Arabian peninsula through Iran up to India, where they are present in a limited number. In South East Asia the species is replaced by a rather similar congener, named Great-billed heron (Ardea sumatrana) rightly due to the bill much more robust and pronounced than that of the Goliath heron. The whole range and the habitats occupied by it are shared with the Purple heron (Ardea purpurea) practically a similar species but of dimension remarkably more reduced. However, both have the same habits and the same marked discretion, therefore, living practically isolated even by their similars, it is difficult to compare them directly on the field. 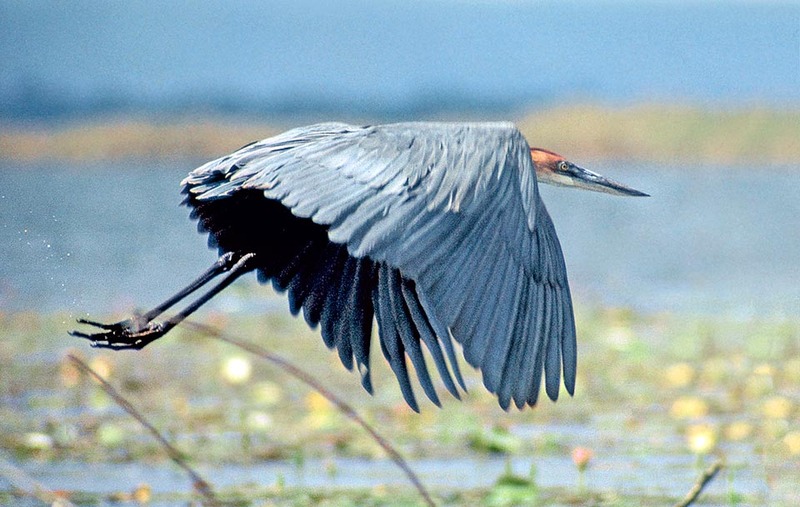 The Goliath heron is normally sedentary and does not migrate if not for very short distances, moving between near swampy zones or to look of others, when the preferred one dries up for long time. 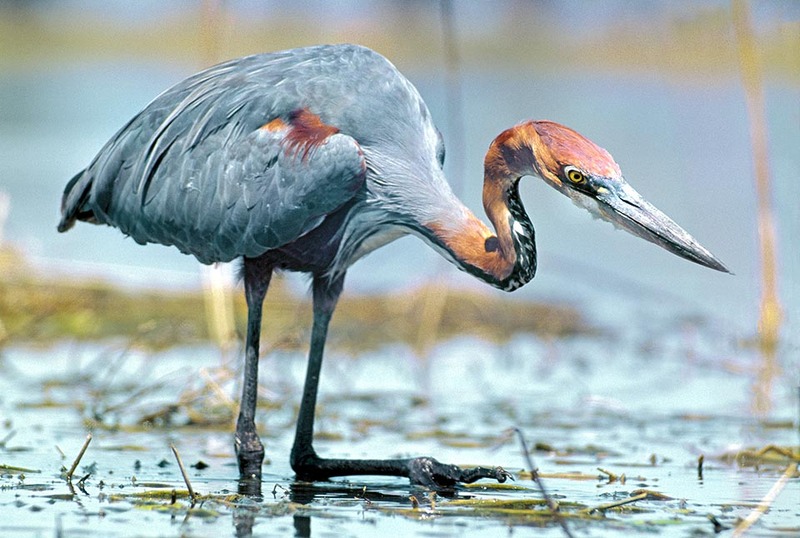 Like all ardeids also the Goliath heron frequents swamps and reedbeds, rivers and lakes, lagoons, shorelines and costal forests of mangroves and only occasionally high dry brush, but always very close to the water. It absolutely avoids water surfaces frequented by man, in which case it hides in remote corners of the swamp well far from any human presence. It is a bird with a mainly nocturnal activity so during the day it keeps hidden among the branches in the reedbeds or, anyway, little visible. On the other hand, its reddish colour and the very long neck usually kept stretched upwards, are reason of strong camouflage when immersed in its main habitat. It is a solitary bird and usually taciturn when perched but when flying or at the moment of the take off it loves to emit an unpleasant and choked cry of alarm that can be heard very far away. Its “haark haark” is a typical recurrent sound in the vast African reedbeds. Among the ardeids this species is to be considered as standing along those more linked to the water ans such is its attachemnt to this environment that also during the short displacements from on place to another, it faithfully follows the water streams flying over them accurately and practically drawing from above the conformations or the bends of the river it’s flying over. It has no difficulty in settling in quite deep water seen the very long the stilts it has but always choses still waters or with very slow flow. It is a lowland bird but in the equatorial areas, when available, it frequents swamps up to the 2000 m of altitude. 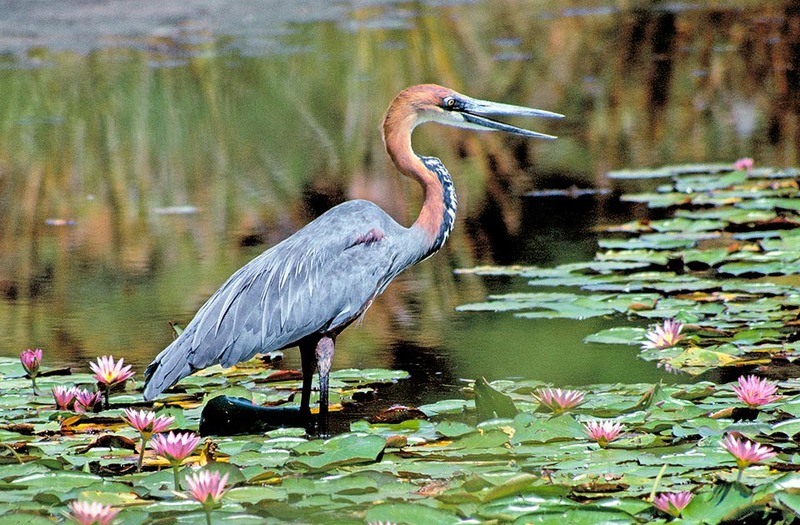 The dimensions of the Goliath heron are remarkable. It is 150 cm long, weighs about 4 kg and the wingspan is of more than 220 cm. Standing upright, its is practically as tall as a man. The alar cover and the tail are of slate grey colour that gets a shade of reddish cinnamon, going up on the neck up to the head, where the amber colour is greatly enhanced. On the head it has a tuft of threadlike feathers hanging messily on the nape but may also raise also the front feathers of the head like a small tuft, when upset. The neck, in the fore part, is white, marked by long black spots forming vertical streaks coming down on the chest. Always from the chest hang very long and filiform whitish feathers that form a small and elegant gag that waves at the minimum blow of wind. The abdomen and the trousers are of a nice lively brick red that widens and covers totally the under wing cover, well visible particular when flying. The long legs, greyish, are bare, with very wide foot and very long fingers and strongly clawed. The eye has straw yellow iris, well marked and fairly big, particularly suitable for its night activity and is surrounded by violet green shades and by short blackish lines. The bill is exceptionally big, long and sharp, more than 20 cm long, a deadly weapon it uses like a real spear and with the typical mastery of the herons, piercing the preys with absolute precision and paralyzing them instantly. The female is perfectly similar to the male even if it has a slight and minor dimension. The livery of the immatures is much more reddish than that of the adults and does not evidence the grey on the alar cover and the black spots on the neck. The flight is slow and majestic, with a frequency of the flapping of the wing rather reduced for a so heavy species, very similar to that of our Great white heron (Ardea alba) but supported by an aerodynamic lift surely unusual seen the enormous wingspan the nature has given him. During the flight it keeps the legs totally stretched backward, visibly beyond the length of the tail and the neck typically S-folded as is a habit for the ardeids. 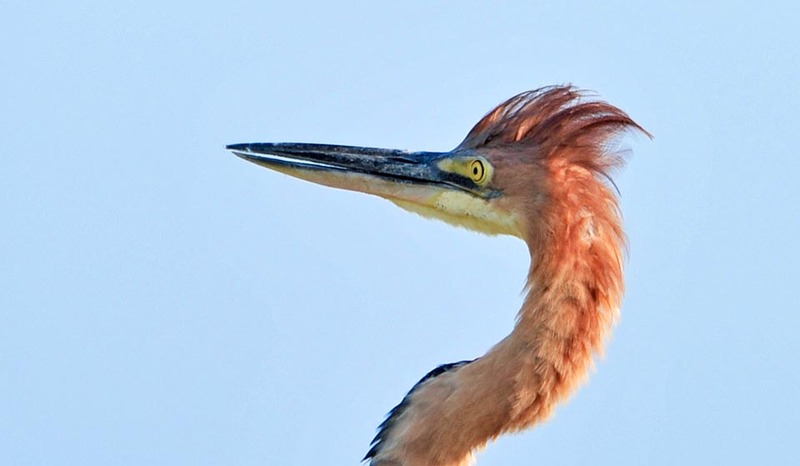 The Goliath heron nests on the ground, isolated, in inaccessible places inside reedbeds or marshy woodlands. It is also very territorial and defends fiercely the area occupied at times even from its same similars that it does not want absolutely in the offing in any period of the year. However, small colonies may form scattered on limited territories, in the case of frequentation of islets in the middle of a stretch of water or thick and impenetrable reedbeds. As mentioned before, the nest is placed on the ground but is always concealed by the surrounding vegetation. The giant heron has more fear of being observed than of being attacked by its predators, therefore it tries to create around an occlusive barrier more than a shelter from above. On the other hand with the size it has it can be predated only by very big eagles or nocturnal predators of large size, always if they can overcome the defences of its terrible bill able to mortally pierce from side to side any foe, before a possible defeat. Conversely, the species is most affected by kleptoparasitism that is, the predation among the animals facilitated by the particular laziness of these birds that, besides moving slowly in flight and in their usual activities, display a slow reaction to any occurrence. For this reason the nest is predated more during the absences of the parents than by direct aggression of an aggressor. It is built an ample platform of stems and dry aquatic reeds, of leaves and small branches, of more than one metre of diametre, leaning on trunks, on shambles of phragmites but also on the ground when not flooded, inside which is formed a little deep cup where are laid 2-5 light blue eggs, brooded for 4 weeks. The chicks leave the nest after 5 weeks but often they keep hidden in the nearby thicket and only after 70/80 days they become totally independent. 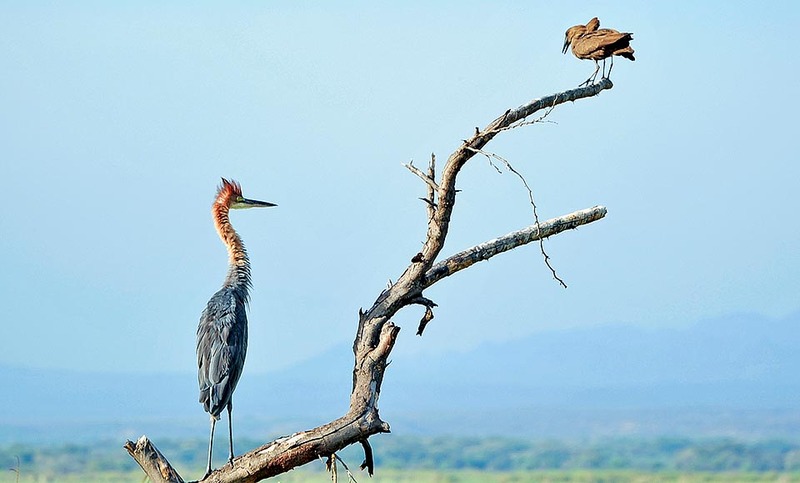 The Goliath heron forms a monogamous couple, often united for the whole life, hence the partners keep always in close contact all over the year. The patience of the heron while hunting is notorious. We see it steady, rigid and still, plunged to its knees for hours waiting for the prey to pass by its feet to then inexorably fork it with its long bill. It does not love small preys or unsatisfactory for its size but waits and hunts only large mouthfuls. The small fishes pass safely by its feet without any problem and are not even observed but as soon as the fish reaches the desired size the attack is triggered. The preferred preys are 30-40 cm fishes of a weight of 1 kg, consequently a pair of mouthfuls per day are more than sufficient to grant the livelihood to this bird. However, it does not disdain to catch, from time to time, frogs and water snakes, big insects and lizards, shrimps and small rodents and even nestlings of other species. 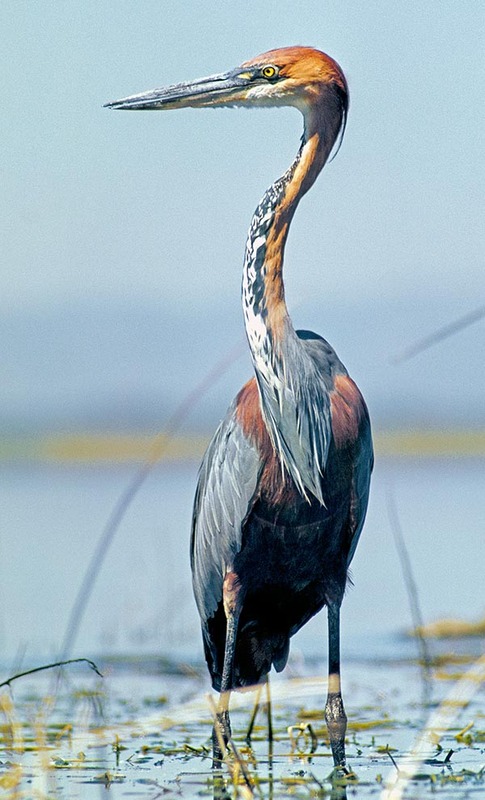 Three species of giant heron have been classified and grouped, morphologically considered connected and belonging to the same genetic strain that has developped in the paleotropical world: the Goliath heron, the Great-billed heron (Ardea sumatrana) and the White- bellied heron (Ardea insignis). Three large birds, elegant, slender, with a regal and austere livery and equipped with a natural foil equally sharp and refined to be envied by the description done by Dumas of his Three Musketeers. The fourth, D’Artagnan, is missing, but as we know, it was a complementary character, he entered the story later on and as such we cannot say that in the future genetic insights on these birds, a new main character does not suddenly show up on the stage. 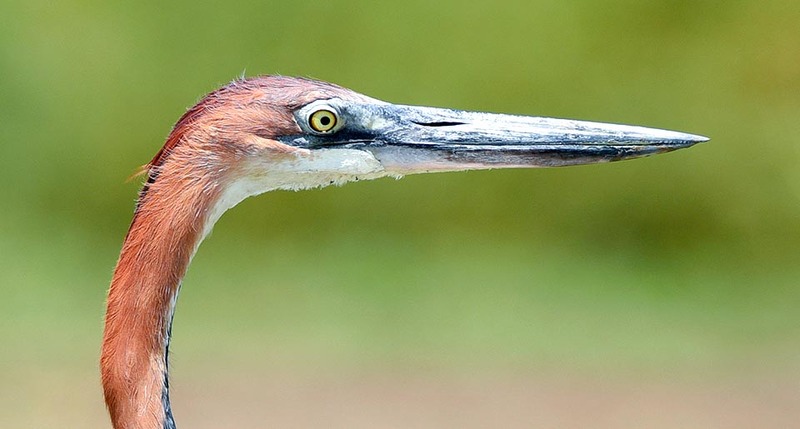 The Goliath heron has a very long life expectancy as it may reach the 20 years of age. Due to this characteristic, supported by the vastity of the occupied territory, the species is not considered at risk.